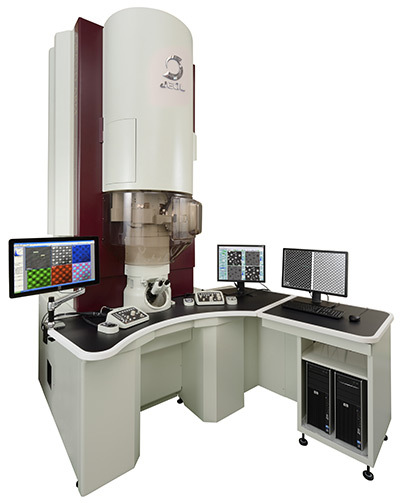 The new JEOL JEM-ARM300F Transmission Electron Microscope exceeds atomic resolution boundaries for any commercially-available TEMs today. Designed to meet the most advanced materials development requirements for atom-by-atom characterization and chemical mapping, the Grand ARM, with 55pm resolution at 300kV, offers the highest level of performance in the JEOL line of atomic resolution microscopes. The University of Glasgow has opened an innovative new structural biology centre, home to a cutting-edge electron microscope -­ the first of its kind in Scotland - that will be used to image biological molecules at the atomic level. JEOL-proprietary spherical aberration correctors integrated in the image-forming system and illumination system, and automatically controlled using the JEOL COSMO corrector system module. Ultra-stable cold-cathode field emission electron gun features a high brightness beam with minimum chromatic aberration. A complete line of signal detectors are available, including EDS up to 100mm2 and EELS, backscattered electron detectors, and up to 4 STEM detectors. The TEM also supports simultaneous observation of high angle annular dark field image, low angle annular dark field image, annular bright field image, and bright field image. The vacuum system is specially designed for pre-evacuation and enhanced column evacuation, achieving higher vacuum while minimizing contamination. The Grand ARM can be configured for ultrahigh resolution imaging or analytical applications for high sensitivity and in situ analysis according to the user's needs.